"Life with God is a mystery; without God it is an absurdity." Presenting a living Jesus to a dying world. The Real Presence Of Christ In The Eucharist......including Eucharistic Miracles. Perpetual Adoration Of The Blessed Eucharist......one parish's step-by-step guide. The Catholic Mobile...... 110 pages/4400 links to everything. No Jesus, No Hope. Know Jesus, Know Hope......pretty neat, huh? So is the site! The Catholic Encyclopaedia......what a project !!!. Summa Theologica......by St Thomas Aquinas. It's quite brilliant,...and big !!! The Catholic Goldmine......it's brilliant !!! Catholic Resources On The Net......a significant contribution. Christian Classics Ethereal Library......there's a lot in this. Two Thousand Years Of Catholic Writings......brilliant !! Mainly by Saints & Popes. Catholic Prayers......a bookmark must !! And it's more than just prayers. Have a look. Catholic Kiosk......more than a kiosk, it's a wonderful Catholic supermarket - a great site in itself and a good jumping off point for other worthwhile links. Christus Rex......a million top links and hundreds of images from Vatican City, The Sistine Chapel & others. Resources For Catholic Educators......good links. Internet Theology Resources......a big site & very interesting. The ClearLight Massive Roman Catholic Links Page......quite substantial. Robin's Religious Page......Robin is a Catholic convert. Catholic Answers......to? Have a look and find out. The Beggar King Homepage......Catholic Apologetics. A Touch Of Heaven ......Alan Ames Ministry. Mother Teresa Of Calcutta......her life & her mission. Catholic Social Justice Issues......over 1250 related links. Uniya - Jesuit Social Justice Centre......in Australia & includes Jesuit Refugee Service (Australia). priests, social justice, women etc. Documents Of The Roman Catholic Church......including Vatican 11. Other Links Of Interest......good ones, including some of the above. Chronic Illness Support Newsletter......and He will give you rest. Year Of The Holy Spirit. THE BLESSED VIRGIN MARY : MOTHER OF GOD : MY MOTHER The Immaculate Heart Of Mary......great interactive forum. 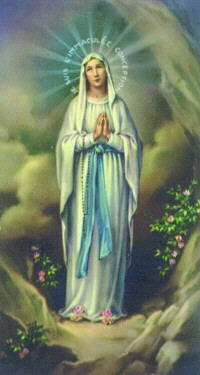 The Blessed Virgin Mary......from Catholic Kiosk. The Immaculate Heart Of Mary HomePage......good links. The Mary Page ....with good Apocalypse & Apparitions sections. The Blessed Virgin Mary......with links. Mary : Coredemptrix, Mediatrix, Advocate......a comprehensive text explanation. Mary : Coredemptrix, Mediatrix, Advocate......from The Magnificat Meal Movement. Mary : Co............a text file relative to the above. A quick "Save" for later reading. Congregation Of Marians......I think Mary would like you to have a look. The Scriptural Rosary......excellent, with good downloadable holy pictures. The Way Of The Cross......in pictures, from the Passionist Research Centre. Immaculata Home Page......dedicated to The Sacred Heart Of Jesus and The Immaculate Heart Of Mary. Devotion To The Two Hearts......it's origin & history. The Mantle......of The Sacred Heart Of Jesus and The Immaculate Heart Of Mary. Catholic Apparitions Of Jesus & Mary......a good site with related links and Catholic Church "approval codes". "The Thunder Of Justice".......a free "plug". It's the title of a book - and really worth reading. Marian Apparitions......a good few links. Our Lady Of Guadelupe......Patroness Of The Americas and Defender Of The Unborn. Mary & Purgatory......The Brown Scapular Promise. Our Lady Of Fatima......includes Devine Mercy. The Spirituality Of Fatima & Medjugorje......text only. Our Lady Of Medjugorje......Mary's last apparitions on earth. Pope John Paul II's Visit To Sarajevo......he didn't quite make Medjugorje. Weeping Madonna of RockinghamWestern Australia. Audrey Santo......an Alta Vista search result. Magnificat Meal Movement......Jesus & Mary in Helidon, Australia. Magnificat Meal Movement Disapproved and again by the Catholic Church. The Vatican Web Site......includes the daily news service. Pope John Paul II......one of the best sites on His Holiness. From Poland. The Complete List Of Popes......and,lately,some of their achievements. The Church & Computer Culture......a statement issued by Pope John Paul II. Angels : St Thomas Aquinas......from his Summa Theologica. It's brilliant !!! Angels : The Magnificent Servants Of God......brilliant ! Angels On The Net......information on Angels. Mb's Angel Page......with good links. Angels : Bible Concordance Page...... from Catholic OnLine. Angel Passages In The Bible......may surprise some with the number of references. Angels : A Biblical Perspective......informative. Catholic OnLine Saints & Angels Page......brilliant ! It's got the lot. The CatholicMobile Saints Page...... links from The Catholic Mobile. The Saints......links from The Catholic Kiosk. It's pretty good. Lives Of The Saints......and other links. Lives Of The Saints......St John Vianney,St Valentine, St Patrick, St Germaine, St Maria Goretti, St Francis Xavier, St Catherine Laboure & the Miraculous Medal, St Vincent Ferrer, St Anthony Claret, St Camillus de Lellis, St Paul Of The Cross, Pope St Pius V.
The Benedictine Martyrology......Saints from The Order Of Saint Benedict. The Celtic Saints......with a few links. The Bible......The Revised Standard Edition - complete ! Bible Notes......a summary of The Bible, book by book. Bible Knowledge Accelerator......great Shareware links. The Bible Code......provided for entertainment only. Biblical Prophecy Sites......quite a few. Prophecy Central......a world of information about biblical prophecy. The Spirit Of Truth Page Revelations, Prophecy, Apocalypse, Solutions(?). The Maranatha HomePage......Revelations, Mark Of The Beast, Anti-christ, etc. HELL "If you don't want to go to hell, you have to want not to go to hell"
HELL......exisits; and we might go there ! A Vision of Hell......granted by Our Lady of Fatima. The Last Things : Death, Heaven, Purgatory & Hell......Biblical references. Jesus' Descent Into Hell......so that's what it means ! Purgatory : Some Good Questions......and better answers! Purgatory : Scripture References & Text Explanations......from Faith Of Our Fathers. Purgatory......what, why & where - briefly. Purgatory - A Part Of Hell ? The Existence Of Purgatory......it's real. A Seer In Purgatory......it's painful. Indulgences - The Remission Of Temporal Punishment......spend less time in Purgatory. Penance......a necessity. Do it ! Project Rachel - Healing After Abortion......there IS hope and help ! Priests For Life......or Priests "Pro Life".Official & updated daily from Rome. Pro-Life Links......supporting the right to live. The Ultimate Pro-Life Resource List......a"Top 20 Internet Site" - Catholics On The Internet. Life Link Central......presented by The National Pro-Life Association. LifeWeb......very good - just like the rest. will themselves also call and not be heard. St. Vincent de Paul Society......from ReliefNet. Society Of St Vincent de Paul : Vincentian Resources......Excellent !!! Society Of St Vincent de Paul......also from St John's University. Also excellent !!! Daughters Of Charity......again, from St John's University. Again, excellent !!! Society Of St Vincent de Paul......from San Francisco. The St. Vincent de Paul HomePage......from Canberra, Australia. Facets Of Religion......the WWW Virtual Library Page. Mike Croghan's Religion Page ......long download time on this link, but there's a lot of information, and it's good - please be patient. The Catagorical Catapult - Religious Links......includes links to Baptist, Bible, Buddhism, Catholicism, Christianity, General, Hare Krishna, Hinduism, Humanism, Judaism, Mormon. Facets Of Religion......links to Buddhism, Christianity, Hinduism, Islam, Judaism, Sikhism. Answering Islam......Christian answers to Islam. Who Is Our Savior ? Allah Or Jesus ?......a pro-Islamic perspective. Freemasonary Corner......from Cutting Edge Ministeries. Other Masonic HomePages......a lot of links. Essential reading. Some Freemasonry "Stuff" & Other Links......make of it what you will! Christian MIDI Room......with links to Christian MIDI sites. Praise & Worship MIDIs......from NewSong. Best Of The Christian Web......not far off it ! The Cutting Edge...... , especially their "Freemasonary Corner". A Chronological Overview Of The Life Of Jesus Christ......with biblical references. From Jesus to Christ......challenges familiar assumptions about Christianity. Anointed Christian Links......one of the best links on this page. Finding God In Cyberspace......this is huge, with extensive & diverse links. Focus On The Future......with biblical references. Mark Of The Beast......it's not from a religious point of view, but please read it. Questions On Christianity......a few questions & a few good answers. Index Of Cults & Religions......from the Watchman Expositor. Quite extensive. The Cult Controvesy......spiritual quest or mind control? Mandate Ministries HomePage......help for those caught up in the deceptive webs of cults & the occult. people inhabiting this planet - most of whom are too poor, uneducated, illiterate and exploited by the rest of us to ever visit this site....or yours ! !